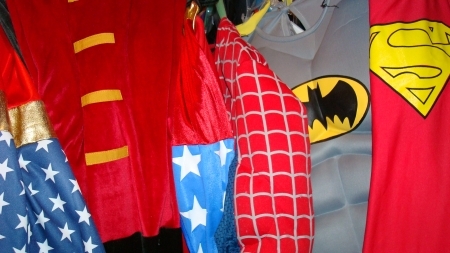 Super Heroes Suits, Super Hero Costumes, DC Comics, Marvel Comics, Avengers, Spiderman, Batman and Robin, Wonder Woman and a ton more Comic Book Super Hero Costumes for Comic Con Dallas. Super Hero Costumes, DC Comics, Marvel Comics, Avengers, Spiderman, Batman and Robin, Wonder Woman and a ton more Comic Book Super Hero costumes for Comic Con Dallas. Posted in Batman, Comic Con Dallas, DC Comics, Marvel Comics, Superheroes and Headliners, Superman, Wonder Woman | Comments Off on Super Heroes Suits, Super Hero Costumes, DC Comics, Marvel Comics, Avengers, Spiderman, Batman and Robin, Wonder Woman and a ton more Comic Book Super Hero Costumes for Comic Con Dallas. Who is your favorite super hero? Chances are we have a costume for you. We have super hero costumes for men, women and children. We also have all the capes, robes, tights, wigs, spandex clothing, lumea clothing, capes, accessories, etc., pleather clothing, capes, accessories, etc. and so much economy and high quality items you won’t believe it. You are in Superman category.